Quotes about dogs abound on the internet. Using original images, we have created our own for your enjoyment. 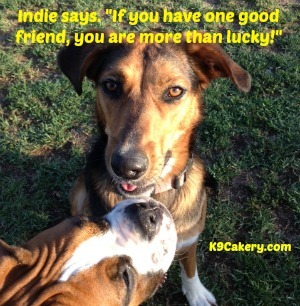 Dog lovers enjoy wonderful sayings that describe how they feel about their pets. They consider their pets to be part of the family, and they love to read quotes that support similar thoughts! 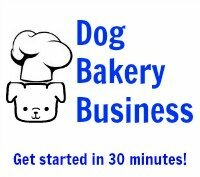 If you have a dog treat business, and you contribute to social media sites such as Facebook, consider posting pet quotes every now and then to connect with your customers. Pets are lovable and irresistible. Ask your customers if you can take a photo of their pet. Then create a nice little image and post it to your social media account. You can be share it will be shared and not only provide the dog owner with endless gratitude, but also will help spread word about your business. If you love dogs, you will find this fun and entertaining. Simply take your camera...and nowadays you will likely have a camera in your phone...and visit a dog park, or just be prepared to snap photos of your own dogs. The photo does not have to be perfect because you can use a free photo editor to crop it (cut out unnecessary stuff in the photo), resize it, and add words if you desire. Download your images from the phone or camera into your computer. Use the free website Picmonkey.com to edit your images. That is all you have to do! Then upload to the site you want. You can add borders, graphics, decorations - just play around with the editing site. You do not have to save your work if you don't like the result. Buckley's photo was shot using an iphone! We simply asked him to sit and he complied. Photography experts like to use expensive cameras, but for these purposes, this image is just fine. Buckley has been pinned on Pinterest boards and shared on Facebook! Dog lovers enjoy the message which is perfectly clear. 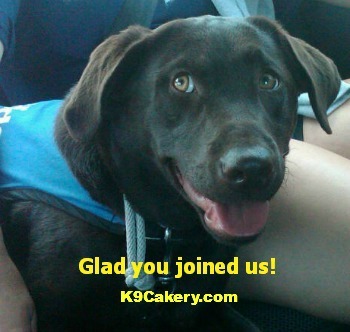 Dee, a beautiful chocolate lab, graces a welcome photo for K9Cakery.com. 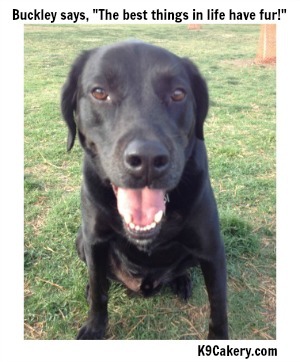 Let your own dog welcome friends and site visitors. 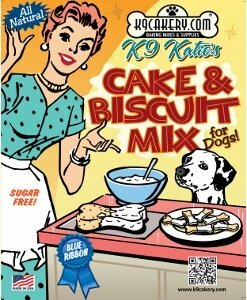 Find baking supplies to make dog cakes and dog treats.